Cut off ends of eggplant and slice in half lengthwise. Cut each half into thirds and then turn pieces and slice into thirds again. Cut zucchini into half inch slices, discarding ends. Cut mushroom into 1/2 inch strips. You will want to soak up any extra moisture from the cooked veggies. To do this, set out some paper towels on a cutting board. As you cook the veggies, transfer to the paper towel. Spray a large skillet with non-stick cooking spray. On medium-high heat cook the zucchini slices 3 minutes per side. Remove to paper towels. Re-spray pan and cook mushroom slices 2 minute per side. Remove to paper towels. Re-spray pan and cook the eggplant slice 3 minutes per side. Remove to paper towels. Re-spray pan and cook fresh spinach until tender. Remove from heat and place in a mixing bowl. Add the ricotta cheese, and seasonings. 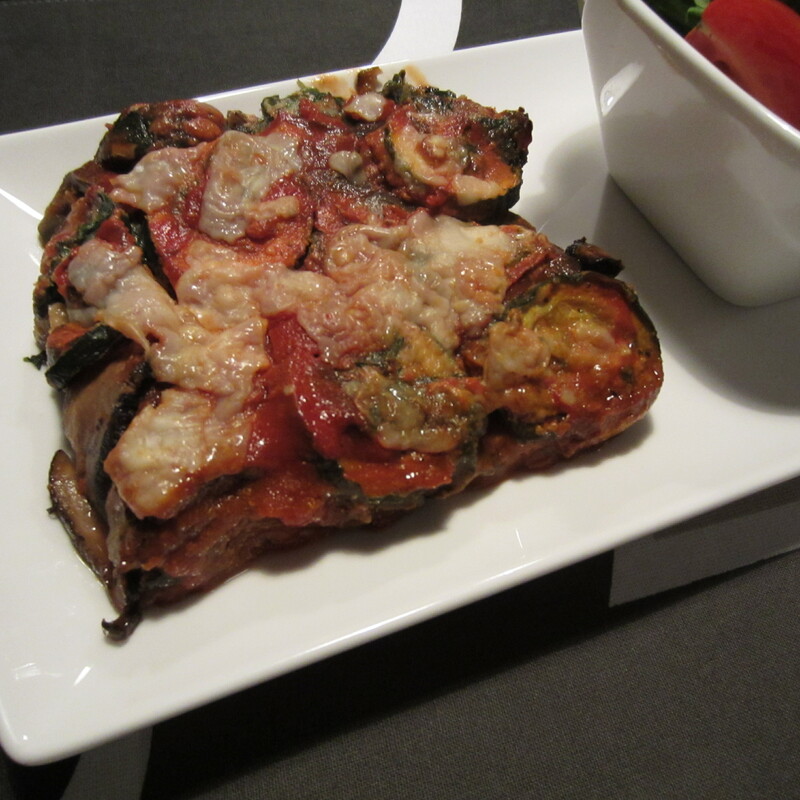 1/3 tomato sauce, 1/2 eggplant slices, 1/3 ricotta spinach mixture, 1/3 zucchini slices and then 1/2 mushroom slices. Add a layer of Add another 1/3 layer of tomato sauce. Continue with a second and third layer. If you have any leftover tomato sauce spread onto the final layer. Bake in 425 degree oven for 25 minutes in an 8 x 8 baking dish. Allow to cool before slicing into serving sizes. Serves 4 at around 225 calories per serving.